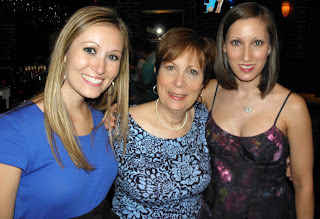 My mom was very blessed to have three beautiful daughters, with two out of three born near major milestones in her life. My sister, Laura, was actually born on my mother's birthday, and I was born near Mother's Day. Some years my birthday actually falls on Mother's Day, and as I grow older, I realize the value in sharing this special day with her. My mom is a great lady, and when I think of having children myself, I often think of how patient she was with us growing up, and how she never bought anything for herself so we could have the best of everything. When thinking of her and her selflessness, I also think: I could not do that! I feel like I'm a pretty selfish person. I like spending money on myself, as you know since you have seen my extensive wardrobe. I like having time to myself to read, watch TV or just veg out. I definitely like my sleep. I like working and have aggressive career goals for myself that don't really fit in with taking time off to have a child. I also see my friends with children constantly having to use up vacation days or leave early for doctor's appointments and other emergencies. I also see how much they have to spend on daycare just to continue going to a job everyday. As more and more of my friends become mothers, I realize how much they have to give up for their children, and I'm truly in awe of them. I really don't know if that's what I want for my own life, but I respect them and have one question as I listen to stories of sleep deprivation, day care issues, snotty noses and the like: How do you keep sane? I don't know if I could. I'm glad we have a day to celebrate moms around the world, because they are so truly special. Saturday night, we took my mom out to dinner for an early celebration. Although my sister, Gail, was out of town for a wedding, here is a picture of my mom with two out of her three daughters.